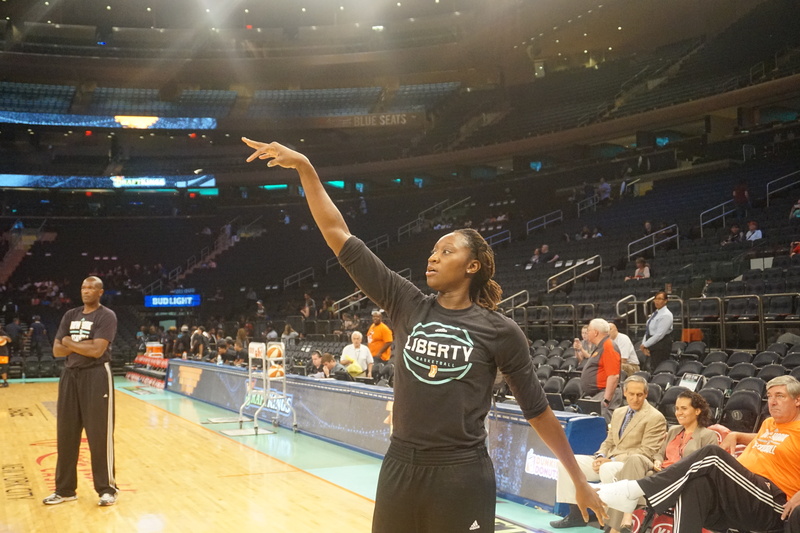 After a deflating loss against the Seattle Storm, on a night where Swin Cash was honored the Liberty return to action on Friday night to face the Connecticut Sun. The Liberty clinched the 3rd seed in the WNBA and were looking for a season sweep of the Sun. As the playoffs near it is important for the Liberty to get into a rhythm and stay away from their recent up and down performances. The Liberty defeated the Sun 83-76 in their last meeting in July. The Liberty jumped out to an early 15-7 lead in the first, however the Sun, behind Camille Little and Chiney Ogwumike came back to pull within 2 at the beginning of the second quarter. Sugar Rodgers had the hot hand in the first for the Liberty as she had 6-points and continued to show her growth in this her 4th year in the league. Tina Charles added 5-points in the first period as well. The game became tight in the second period as both teams traded baskets and the lead. Chiney Ogwumike was aggressive on the boards to begin the game however her team would ultimately lose the rebound battle in the game by quite a large margin. The Liberty took a quick 5-point lead after Epiphanny Prince hit a big shot from behind the arc with 4:39 left in the half making the score 31-26 in favor of the home team. The Sun would not go away, Courtney Williams (Sun) hit a 3 of her own and pulled her team to within 2. With 3:02 remaining in the half Williams, (Sun) again hit a jump shot in transition to tie the game at 31. Tina Charles responded for the home team as she hit an and-one lay-up to give the Liberty a 3-point lead, the crowd erupted with chants of MVP MVP MVP! The Liberty made another quick run to push the lead to 8 with 42.2 seconds left but like clockwork the Sun responded and pulled to within 4 forcing a Liberty timeout with 15.4 seconds left. The score would be 44-38 at the half in favor of the Liberty. Tina had another monster first half as she tallied 17-points to lead all scorers. Courtney Williams led the Sun with 14-points. Tina once again spoke about her huge first halves, she remains confident and want to be aggressive early to give her teammates that edge and eagerness to follow her lead. She wants to focus on encouraging her teammates so that they can also be confident and play at a high level especially as the playoffs near. The third quarter again saw the teams trading leads and once again Sugar Rodgers had a big 3rd. Sugar had 10-points and led the charge in the third. Epiphanny Price also had a productive 3rd period. The Liberty led 64-60 with 1:50 to go in the period. The Liberty controlled the glass throughout the game by the end of the 3rd they already had 33 rebounds, 23 of which were defensive. At the end of the third the Liberty led 67-62 and seemed to be in a good offensive rhythm at that point. At the end of the third the crowd erupted into screams of joy and admiration for Knick legend John Starks who was in attendance. Also at the game, Olympian Tori Bowie who also received a boisterous ovation as the garden cameras scanned celebrity row. To begin the fourth the Liberty opened up with a quick 4-0 spurt as Amanda Zahui-B scored under the basket in a set play which was followed by a great defensive play that led a Sugar Rodgers lay-up in transition. The Liberty took a twelve-point lead after a pair of Swin Cash free throws. (76-64). The Sun responded again as they just would not go quietly into the night they pulled to within 4 with 5:58 left in the game forcing Coach Laimbeer to call a timeout and settle his squad down. It was a perfect timeout the team came out with a sense of purpose moving the ball and getting teammates involved. Epiphanny Prince gave the Liberty an 8-point lead then Swin Cash hit a driving lay-up to give the Liberty a double-digit lead. The Liberty won this game with perseverance as they only had eight players dressed for action. Shavonte Zellous did not play as she was nursing a back injury. Kiah Stokes, Shoni Schimmel and Tanisha Wright were all out of action as well with various injuries. Tina Charles had her 18th double double of the season as she finished with 23-points and 10 rebounds on the night. Sugar Rodgers added 18-points, 6 rebounds and 4 assists. There were four players in double figures as the Liberty had a balanced attack. They won the rebounding battle 42-32 as the bigs for the home team were very active on the glass. With three games remaining before the playoffs start the Liberty head out on the road Sunday to play the Dallas Wings. “We want to play the right way, This is who we are, we play solid defense..”- Coach Bill Laimbeer.